The UK Chess Challenge first took place in 1996 and has since grown into the largest children’s chess tournament in the world. The beauty of the event is that it welcomes all-comers from beginners to National Champions and schools from all corners of the United Kingdom take part. There is nothing quite like this in the world of chess. These tournaments are massively popular because everyone in the school can take part and everyone wins prizes. The best players can then go through to the area Megafinal and, skills permitting, to the Gigafinals and National Terafinal. Stage 1 takes part in the school during Spring Term and every player plays seven rounds of chess. Typically the tournament is played once a week either during a lunch break or in an after-school session. Some schools prefer to hold all seven rounds in one sitting – perhaps at a weekend. 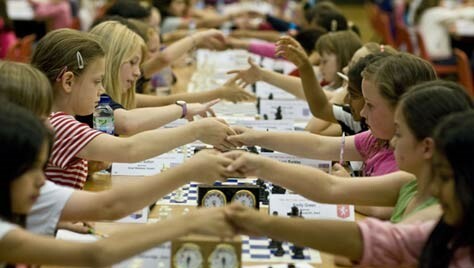 There is generally no travelling involved as the chess games are played at school. 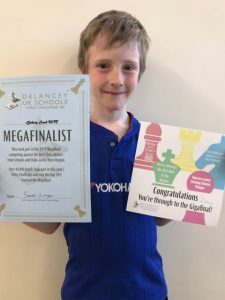 Schools and clubs that enter receive a “tournament pack” which contains prizes and materials such as mascots, certificates, badges, puzzle books and pairing cards – all of which help to run a fun tournament and keep the children engaged and motivated. The rules of the tournament have been kept simple, so that a teacher with only a basic knowledge of chess should be able to run it! 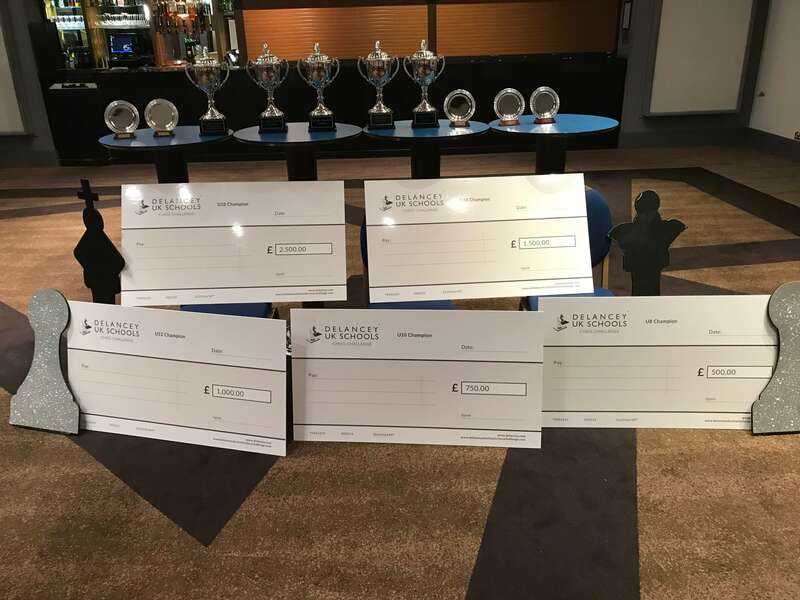 All ages can take part and the qualifiers for the Megafinals are the top scorers in the tournament, plus leading girls and boys in 12 separate age groups from under 7 up to under 18. School entry starts from £25 (+VAT) for 10 players. Each additional block of 10 players is £8.67. School packs are distributed in batches and you will be informed when your pack is on its way. The pack contains everything you will need to run a tournament in your school or club. Stage 2 is the ‘Megafinals’. These are regional events ran by independent local organisers who also run other chess events in their region. Parent’s are responsible for registering their child for the Megafinal – although schools are also able to do this by contacting us. Fees for the Megafinals will vary by region but will not exceed £25 per player. 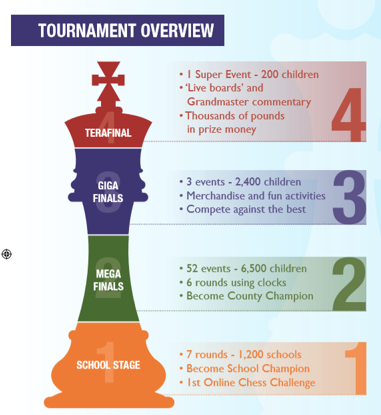 Megafinals take place over one day and are 6 rounds using chess clocks. For many children this is their first experience of playing chess outside of their school. Players who make the qualification score (or who win their section) qualify for the next stage – the Gigafinals. Parent’s are responsible for registering their children online. Stage 3 is the Gigafinals. In 2018 we had three gigafinals in Manchester, Solihull and Twickenham. These are national level events where the best players compete to win their place at the Terafinal. These are large events with side activities taking place. Children finishing in the top three places for their age group will qualify for the Terafinal. The fourth and final stage of the tournament is the ‘Terafinal’. 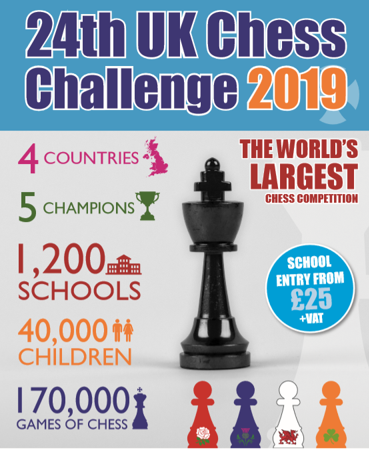 This is the grand finale where the best players from all corners of the UK come to battle it out over the chessboard to be crowned ‘UK Schools’ Chess Champion’ for their age category (under 8, 10, 12, 14 and 18). The Terafinal has live boards where the moves are broadcast live through our partner chess24.com and we also have live Grandmaster commentary. Season 23 has now finished and we can happily say it has been another successful year. 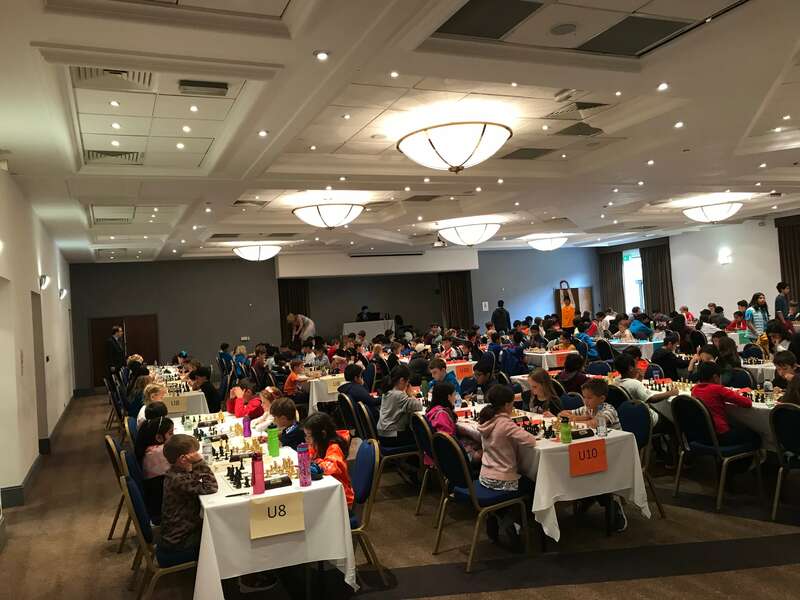 Thank you to everyone who competed and volunteers and organisers who ensured that the events took place smoothly and we were able to deliver a chess extravaganza to 40,000 children. We also added a third gigafinal to cope with additional demand and brought back the “plate” – rebranded the Challenger’s. These two events took part in Surrey and Liverpool and offered further opportunities to our players. Season 24 – 2018 / 19 NOW OPEN ! Season 24 is now open for school entry! We are really excited about some of the improvements for this year. Firstly we have lowered the entry price for schools with small clubs (of 10 or less players) to £25 + VAT. 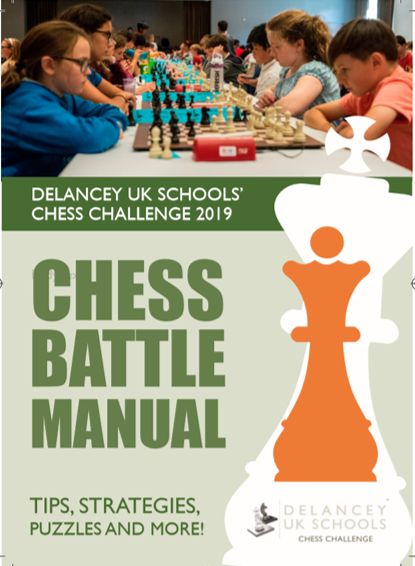 Each kit contains a ‘Chess Battle Manual’ for all players as we feel this will be useful for the vast majority of players entering the competition and will provide some extra practice whilst preparing for the Megafinals. We have also included a teachers guide to make the running of the challenge a little easier. 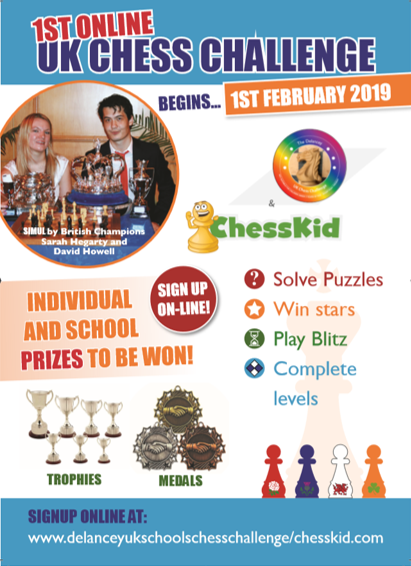 From 01/02/2019 we are launching the First UK Online Chess Challenge in partnership with ChessKid. This does not replace the existing challenge but is an additional event that is free to enter for individuals and schools. Prizes are on offer for the best individual and schools’ performance. 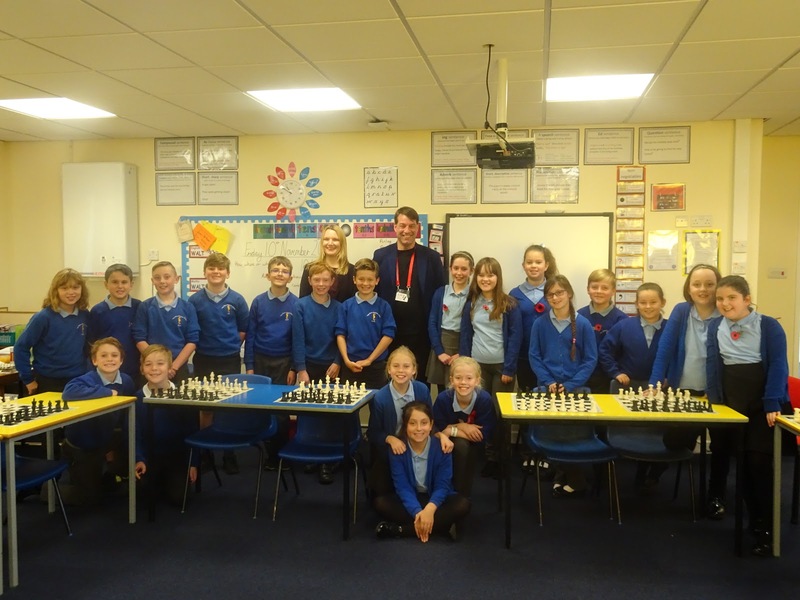 There are many superb online resources available for chess and we believe that the more practice children put in the more they will get out of the game. We believe that ChessKid is the best online chess solution for schools and children and we are happy to be working in partnership with them. We ask for all schools and players to give this a try and help us make it a success. We are also introducing more chess resources for children and teachers on our website in the “Chess Laboratory”. 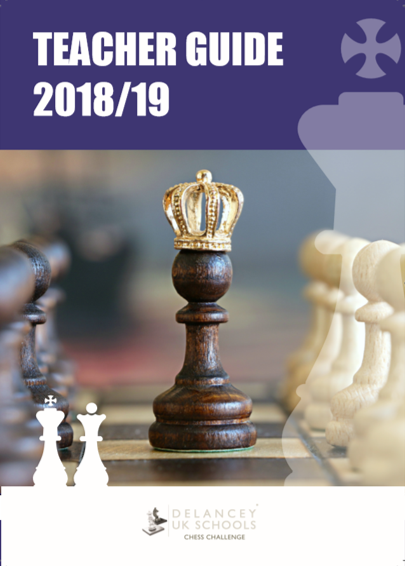 This will include tips and practice exercises for children plus resources for teachers to make running a chess club easier and more rewarding. We hope you will find this useful. Enter online now using the link below.